A few things I enjoyed from around the web last week, along with other newsy bits. Filed under “tiny house love”, this bus converted into an adorable living space. When I see pictures like this, my heart does this little flip-flop of longing. That’s a sign isn’t it? I want to live in one of these someday. Have your kids gotten bit by the homemade slime bug? My 11-year-old makes it by the gallon, it seems. Here’s a recipe similar to hers. I contributed to this book, which was just released in paperback: The Shoestring Girl: How I Live On Practically Nothing And You Can Too. The chapter I wrote is about frugality with kids. Being a big fan of Annie Brewer’s books, I was honored to have been able to co-author. Read a couple of quick reviews here: my favorite books on radical frugality. Don’t forget about this Conquer Your Clutter Ultimate Bundle, (time-sensitive offer) and my offer here for subscribers. Did you see these recent posts? 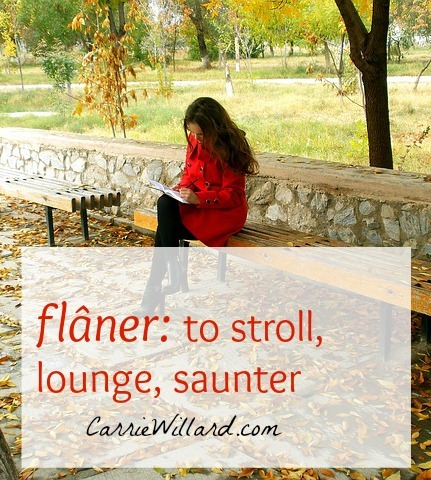 Enjoy your weekend, and don’t forget to flâner just a little bit! Sonia is ALWAYS making slime of some sort (she’s 12!). Glitter slime, colored slime, slime made with various ingredient lists…you name it, she’s made it!